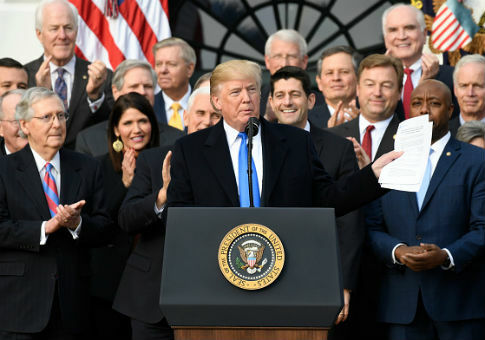 President Donald Trump on Friday continued to tout the Republican tax reform overhaul for encouraging major companies to reward their employees with bonuses, and said that infrastructure legislation is a "perfect place" to begin working with Democrats "in a bipartisan fashion." "Our big and very popular Tax Cut and Reform Bill has taken on an unexpected new source of "love" – that is big companies and corporations showering their workers with bonuses," Trump tweeted. "This is a phenomenon that nobody even thought of, and now it is the rage. Merry Christmas!" Our big and very popular Tax Cut and Reform Bill has taken on an unexpected new source of "love" – that is big companies and corporations showering their workers with bonuses. This is a phenomenon that nobody even thought of, and now it is the rage. Merry Christmas! Several large companies announced plans to increase wages and give out holiday bonuses after Congress passed the Republican tax overhaul bill on Wednesday, which Trump signed into law on Friday. Boeing was the first to do so, committing $300 million to "employee-related and charitable investment," followed by AT&T, which said that it will give $1,000 special bonuses to more than 200,000 employees and invest an additional $1 billion in the U.S.
Comcast announced that it will give bonuses of $1,000 to more than 100,000 non-executive employees because of the passage of tax reform. Multiple companies said that they will increase their philanthropic activity by hundreds of millions of dollars. Trump also indicated on Friday that "rebuilding" the country's infrastructure will be on the top of his administration's agenda for the new year, tweeting that the issue is a "perfect place" to start working with Democrats in a bipartisan manner. "At some point, and for the good of the country, I predict we will start working with the Democrats in a Bipartisan fashion," Trump wrote. "Infrastructure would be a perfect place to start. After having foolishly spent $7 trillion in the Middle East, it is time to start rebuilding our country!" Administration officials have said that Trump will unveil his infrastructure plan in early January. White House officials said that the president was waiting to address infrastructure after Congress passed tax reform. Trump is expected to give Congress a blueprint for an infrastructure bill and allow details, such as funding, to be negotiated in a bipartisan manner. This entry was posted in Issues and tagged Comcast, Donald Trump, Tax Reform, Twitter, White House. Bookmark the permalink.